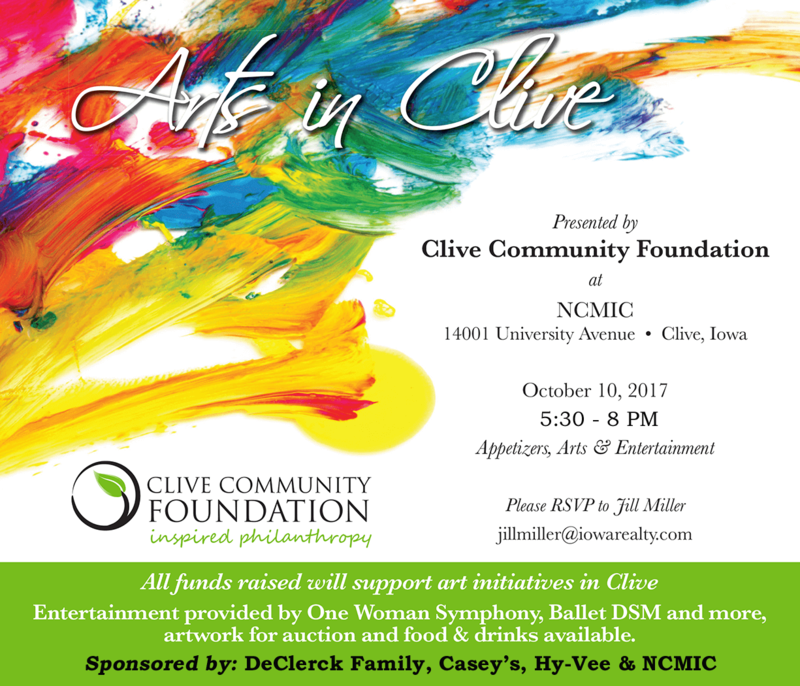 CLIVE, IOWA – September 14, 2017 – The Clive Community Foundation (CCF) will present Arts in Clive on Tuesday, October 10, from 5:30 p.m. to 8 p.m., at NCMIC, 14001 University Avenue in Clive. The second annual event – sponsored by the DeClerck Family, Casey’s, Hy-Vee and NCMIC – raises funds to support the ongoing public art initiatives of CCF. In 2016, the event raised nearly $8,000 to endow arts programs and contribute seed money for the development and installation of the sculpture Radiance. The 18-foot sculpture, which recognizes Clive residents Peter and Anna Marasco, has since been installed at 128th and Woodlands Parkway. Separate from the Arts in Clive event, the CCF contributed an additional $15,000 to the Radiance sculpture project. CCF was established in 2013 and has since raised nearly $285,000 to support arts initiatives, as well as programs that build upon Clive’s commitment to quality of life and health and wellness. Last December, CCF awarded seven organizations $18,800 in community betterment grants. The 2017 grant request cycle is currently underway. Garnaas also encourages Clive’s not-for-profit organizations to apply for CCF’s 2017 grant cycle funds. The application deadline is October 1, allowing time for the grant committee to review the entries and present the 2017 program awards in early December. This year’s Arts in Clive event will feature both visual and performance art, including entertainment by the One Woman Symphony and Ballet Des Moines. To RSVP for the Arts in Clive event, contact Jill Miller at jillmiller@iowarealty.com. The CCF mission is to ignite philanthropy through education, advocacy and pride in our beautiful, safe and distinct city. Since 2013, the Clive Community Foundation (CCF) has improved quality of life for Clive residents and businesses by promoting charitable giving and connecting donors with causes about which they care. CCF is an affiliate of the Community Foundation of Greater Des Moines.